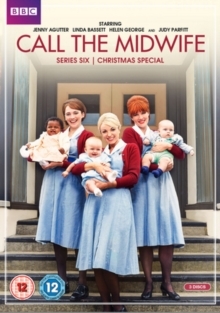 The complete sixth series of the BBC drama, adapted from Jennifer Worth's memoirs, about a group of midwives working in poverty-stricken East London during the 1960s. In this series, beginning in 1962, the Nonnatus House staff return to Poplar from South Africa to find that Sister Ursula (Harriet Walter) has been placed in charge. As they try to adjust to her strict new regime, the midwives continue to care for their patients as best as possible despite Ursula's incidence that they don't become emotionally involved. Later, Trixie (Helen George) returns from her extended stay at the clinic in South Africa and the staff find themselves under further pressure from proposed government reforms to maternity care. Meanwhile, Sister Mary Cynthia (Bryony Hannah) is committed to a mental institution after concerns are raised for her mental health. The collection also includes the 2016 Christmas special.